A dramatic land sculpture, designed by Hebden Bridge based artist, Jane Revitt, has just been installed on a landfill site at Elland near Halifax - one of 50 'Fields of Vision' projects in the region, and part of the Yorkshire Festival which includes 100 days of cultural events leading up to the start of the Tour de France. The 'Swoop' will be clearly seen on the hillside by over 3.5 billion people around the world as the helicopter TV crews fly over following the progress of the cyclists. The aerial photo in the video was taken by Jane from a light aircraft shortly after installation. Someone with a sense of humour must have been involved, as the components were actually made in Lancashire by a family firm, Kedel Limited, based in Colne. Laura Young, their Product Engineer, faithfully reproduced the Starlings as CAD drawings, based on Jane Revitt's original sketches, ready for output to our large flat bed CNC, a state of the art cutting and drilling machine. There were several varieties of different shaped birds in various sizes for different positions in the flock. 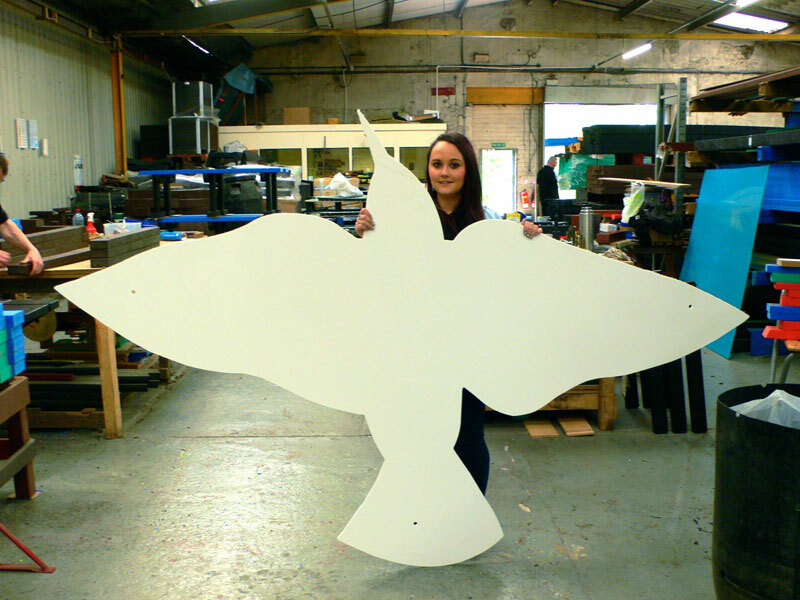 Laura is seen below holding one of the largest Starlings, with a 2 meter wing span. These were all cut from white 6mm PPC sheet (Polypropylene Carbonate) with a high recycled plastic content. "We were delighted to be involved in this artistic project during the Tour de France," says Managing Director of Kedel, Dermot Walch. "The lead time for researching the best materials in recycled plastic sheet, and for creating the CAD design and CNC files was shorter than most companies would have liked," he added, "but we have a reputation for meeting difficult challenges and managed to pull it off very successfully." All the waste left over from cutting out the birds will go back to the plastic sheet manufacturer it came from for recycling again. 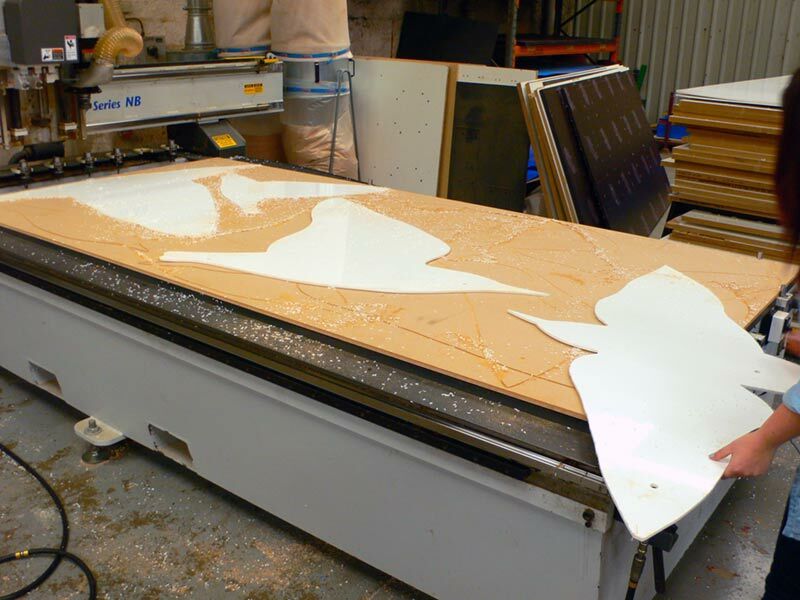 Kedel have an in house design team and large flat bed CNC offering industrial product design and CNC services to businesses all over the UK. The Starlings project is one of 12 large scale land sculptures sited around the UK, 3 of which are sited in Calderdale during the Yorkshire Festival to celebrate the Tour de France, which starts in on 6th July 2014. Starlings were chosen for the design theme because they are in decline in the UK. The swooping flocks were once a common sight in the North of England during the migration season. The dramatic swooping movement of this starling flock - over 500 birds - is intended to reflect the cyclists’ peloton, where riders flock together to save energy, just as migrating birds do. "Placing this 'Swoop' of various sized starlings in flight on a capped landfill site in Elland seemed very appropriate, and making them from recycled plastic makes the project environmentally symbolic, as well as eco-friendly, says Lewis Walch, Kedel's Technical Director, "This landfill was in use long before recycling came of age, and would have received many tonnes of plastic waste. These recycled plastic Starlings show how times have changed for the better." Kedel now use the same recycled plastic waste to make a wide range of products, from picnic tables and benches for schools and recreation areas, to fencing, cladding, decking and ground reinforcement grids for construction and refurbishment projects all over the UK. The capped landfill site is not yet open to the public as it is still settling, and methane gas produced from decomposition is being syphoned off to drive a electric generator, which is feeding electricity into the national grid. 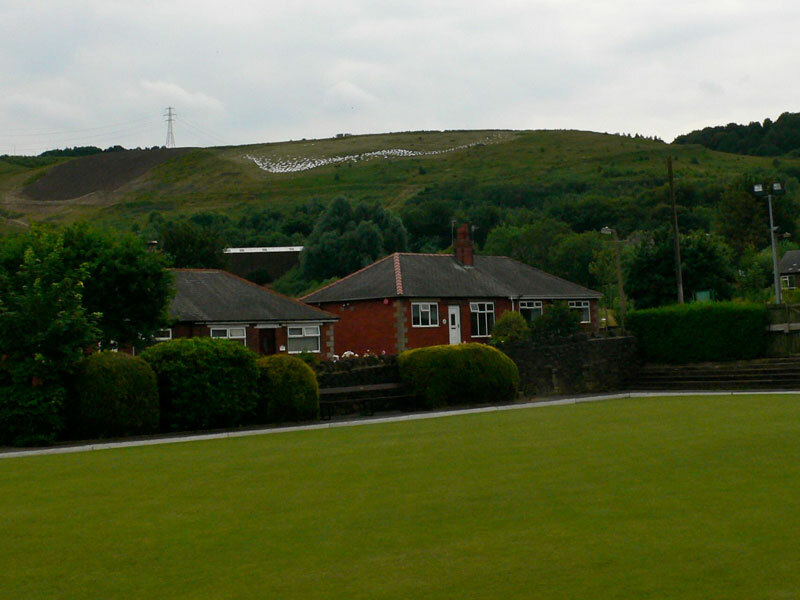 "Placing the sculpture on the facing slope, visible from Elland Working Men's club (seen above), and other points around the town, brings the site into public use earlier than would otherwise have been possible," says Creative Director of the project, Geoff Wood. "This 'Swoop' land sculpture has been installed as a permanent feature of the Elland landscape, and is part of the regeneration plans for the area". Funding came from the LCF (Landfill Communities Fund), with landfill tax credits donated by The Casey Group, working in partnership with the Environmental Bodies, Greenbank Trust and Green Business Network. The Casey Group own the regenerated landfill on which the "Swoop" stands, and were delighted to support this creative approach to bringing the land into public use so soon, especially during the Yorkshire Festival celebrations and the Tour de France.